Pound Cake with Sweetened Condensed Milk is a rich and delicious dessert with old fashioned sweet vanilla taste. We love sweetened condensed milk around here. It’s such a great addition to many desserts. I usually buy about ten cans around the holidays and make fudge for friends and family. 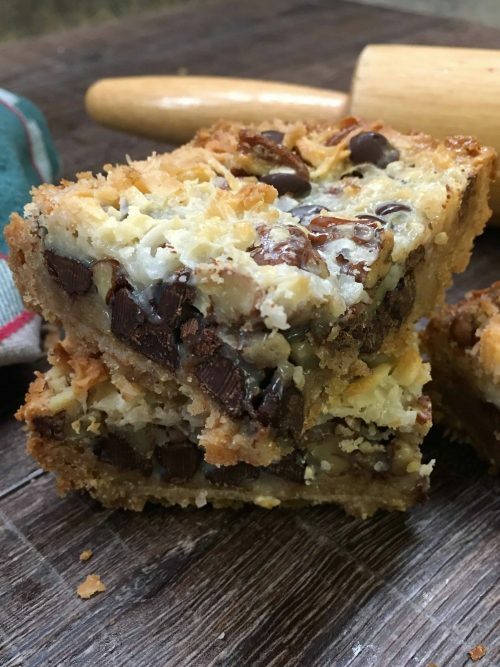 But, there are so many other delicious recipes that contain sweetened condensed milk. It makes this poundcake so much richer. We almost fight over who gets to lick the can when I am making the sweetened condensed milk pound cake. The kids will circle around me waiting until I first get the lid off of the can, and then try and get the remaining drops inside. And, they have me to contend with. I want it all! But, we do share with each other when it comes down to who gets the last lick–most of the time! Get started on the pound cake by adding flour, salt, and baking powder to a small bowl. Mix it up and set the bowl aside. Next, cream the butter in a large bowl. 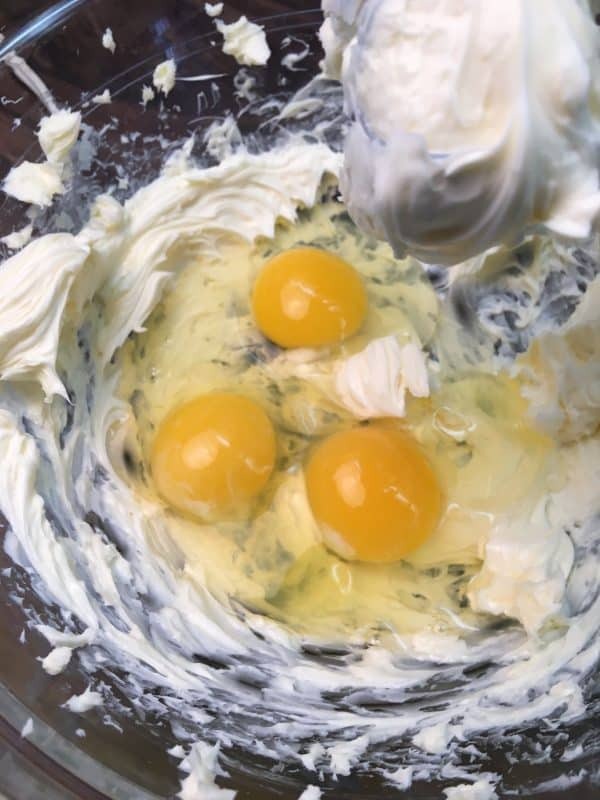 Add the eggs and mix them in well. Add the sugar and vanilla and mix it all in together. It looks a little lumpy, but once you get everything mixed together it will all come out creamy. 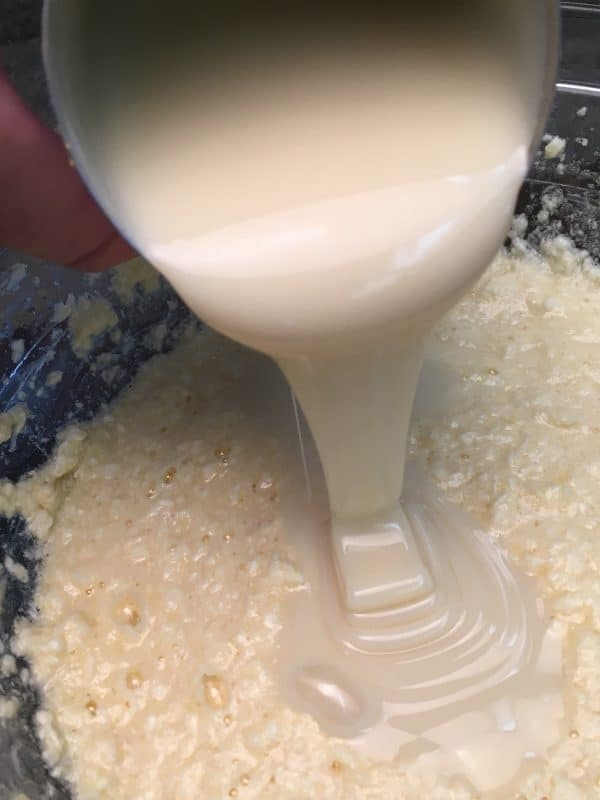 And, the best part…add the sweetened condensed milk. You are seriously going to love this condensed milk pound cake recipe. Mix it up and then add the flour mixture. 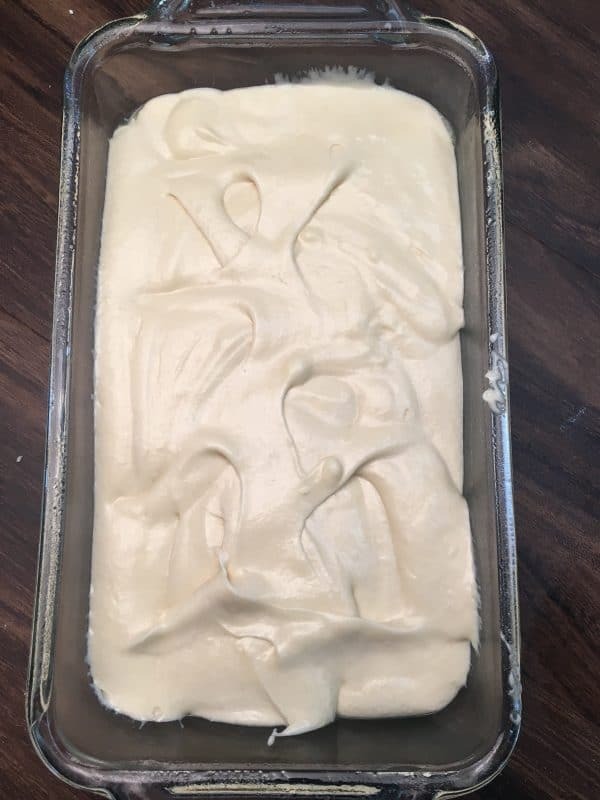 Once you mix it up, pour the batter into a greased bread pan and bake for 60-70 minutes, or until the cake tester comes out clean. 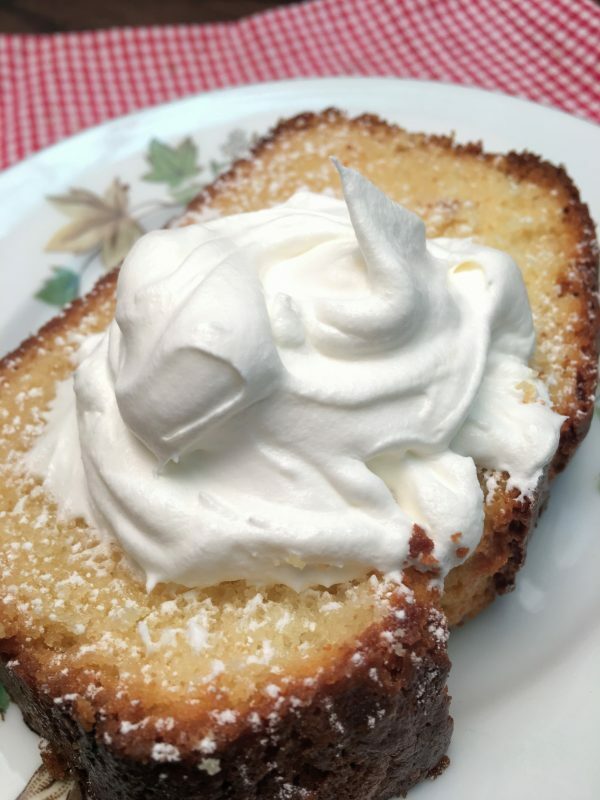 You can add a dollop of whipped topping to the pound cake with condensed milk as a garnishment! Pound cake with sweetened condensed milk is a rich and delicious dessert with an old fashioned sweet vanilla taste. 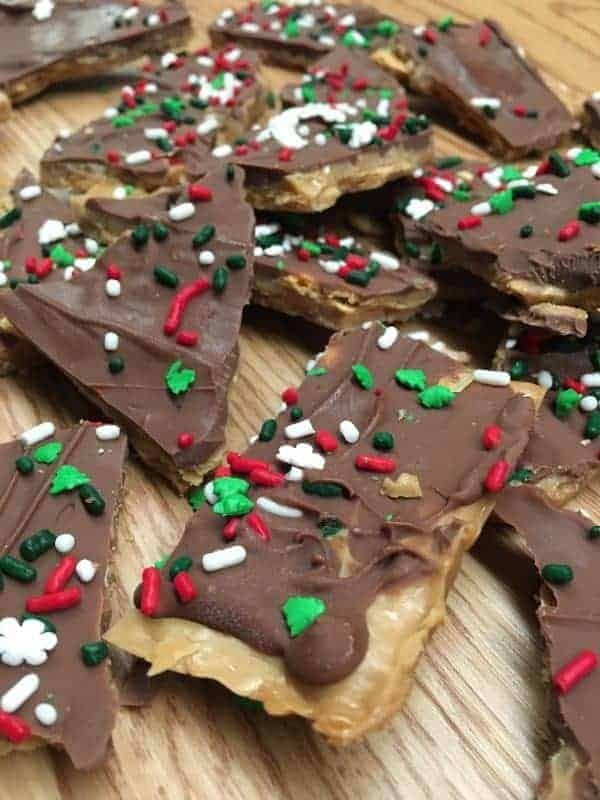 The homemade southern treat is perfect for Christmas or any holiday. Grease bread pan with nonstick spray. 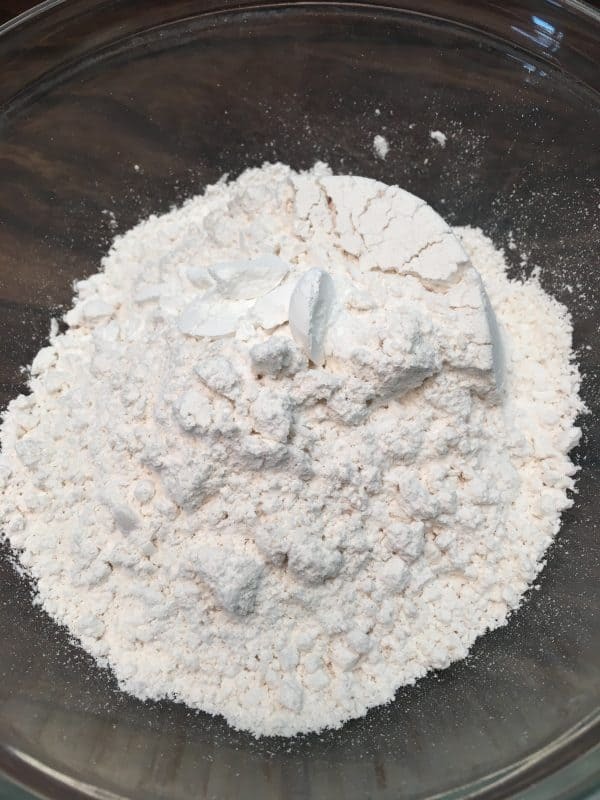 In a small bowl combine flour, baking powder, and salt. Set aside. 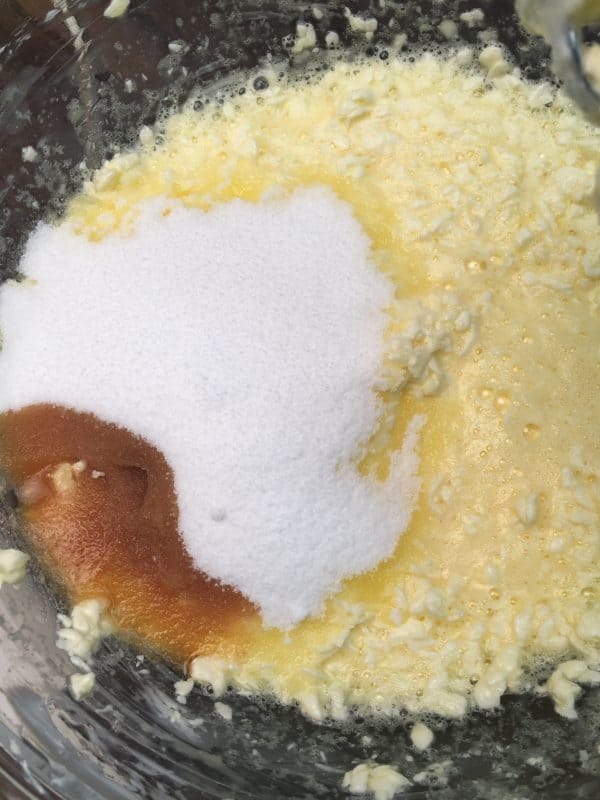 Add the eggs, sugar, and vanilla and blend together. Add the can of sweetened condensed milk and blend together. Add the flour mixture and blend together until the batter is smooth. Pour into greased bread pan and bake for 60 minutes, or until cake tester comes out clean. 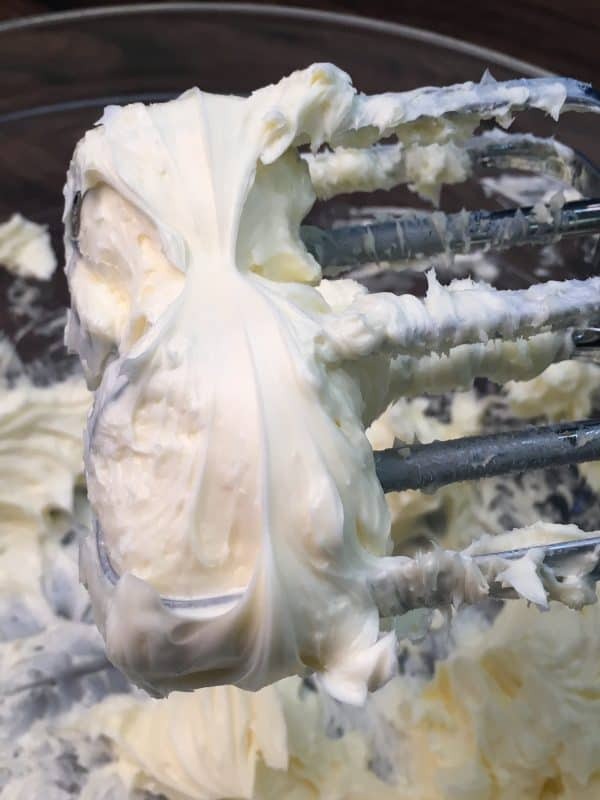 Hi what kind of icing is shown in the picture? 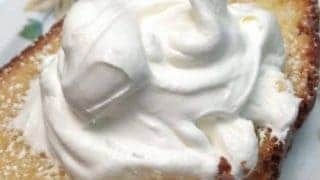 It’s a dollop of whipped topping. It’s the Aldi’s version of Cool Whip. Tastes delicious on top! Hi Pat! I have not made it in a tube pan. I’ve only used the glass bread pan. I am not sure if you need to adjust anything. I would think you could bake it with the above measurements in a tube pan. If you do, let me know how it turns out! Hi Pam! I think a bundt pan is a great idea, too! I bought one at the thrift store not long ago. I should get it out and try it in that. This looks amazing! I am a pound cake fanatic!!! I’d never seen a pound cake made with condensed milk, so I gave it a try. I added some lemon zest and lemon juice, it was amazing! Hi Dee! That’s great to hear. I bet the added lemon zest and juice was delicious! Thanks for sharing, and I will have to try it with lemon soon! Yum! I love that the ingredient list is short! Hi Suzanne! I love short lists, too! Thanks for sharing! Does this last very long? I’m excited to try it! Hi Vanessa! We ate it pretty fast, so it didn’t last long at our house. Keeping it in the fridge will help it last a little longer. I think it would start to dry out after about three days. Thanks for stopping by! Let me know how you like it. Looks delicious but I have a question : why adding sugar if you are already using sweet condensed milk? Hi Adela! It is a lot of sugar, but it makes the pound cake even sweeter. But, even with the sweetened condensed milk and sugar, it’s not overly sweet. I’m curious how it would taste without the sugar, though! Thanks for the idea. This was a fantastic cake! We took a few slices to an elderly neighbor then the rest magically disappeared…. Here are my husband’s words, “This is the best pound cake I’ve ever had. 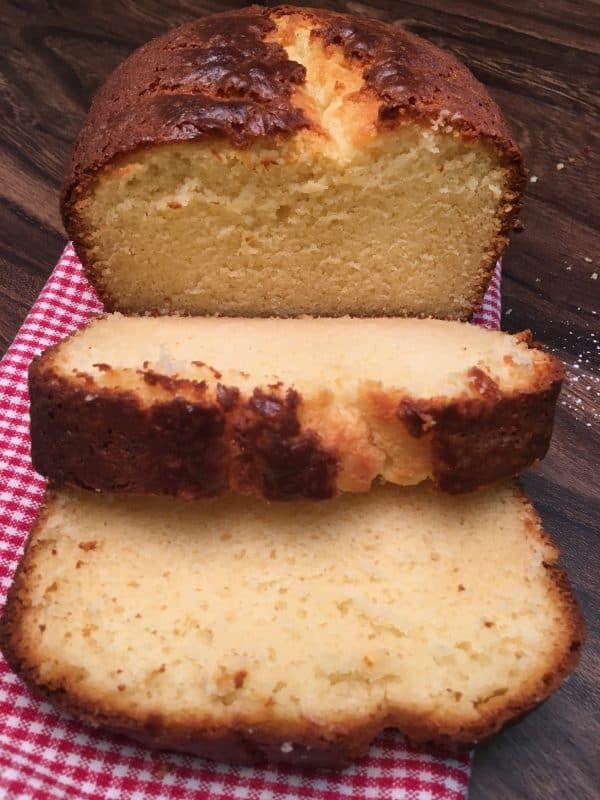 I usually don’t like pound cake because it’s dry and bland but this one was awesome.” Win-Win-Win! Hi Becky! Wow! Super excited to hear what your husband had to say about the pound cake. Glad that he liked it so much! I love to hear what y’all think about the recipes! Funny, it magically disappears around here, too. (Wink-wink). That was very sweet of you to share with your neighbor. Could I possibly make this in a bundt pan? Do you think it would be enough for one? It’s worth a try! If it’s a smaller bundt pan I think it will work. If it’s a large one, it might be too big for the recipe. Let me know how it turns out. I used the only bundt I had, it was a large one, so the cake itself was a little short and it was dense, so I don’t know if it was the pan or what! Still taste great!! Hi Emily! Glad to hear it still tasted great! Thanks for coming back and sharing your results! I used a glass loaf pan that was 9 x 5.25 x 2.75. I got out a ruler and measured the side of my glass loaf pan and it was really about 3-inches. You would need at least 3-inches because it will rise in the pan when it bakes.